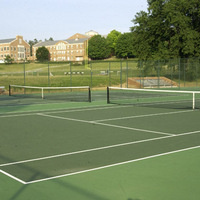 The Ray Campbell Adult Tennis Camp offers instructors and coaches with years of professional playing and coaching experience. The full camp runs Friday morning through noon Sunday with 16 hours on court. Each day has morning and afternoon sessions that include several short instructional periods followed by more drills and doubles play. The camp ends with a round-robin doubles tournament for players at all levels. For more information, contact peterlr58@hotmail.com.